Having barely caught our breath from our Cob course and visiting friends mainland visit in May / June we were off the island again, hence our silence. With just one night to ourselves after we arrived home before we had a tag team off WWOOFers with us we packed ourselves up and left Rum again to visit friends and attend the Royal Highland Show – something we had been planning since last year when we intended to go but never quite made it. We have friends who live close enough to the showground to travel in each day so it was a perfect opportunity to spend time with them and go to all four days of the show. When in Sussex we used to go to the South of England Show every year and it was a real highlight of our year – plenty of animals, agriculture, stands showcasing or selling the latest clothing, gadgets, technology and ideas in farming and working the land. It was always a long day of walking round the showground, rushing to take everything in and arriving home sunkissed (I think it was sunny every single year we went!) and exhausted. But a day was enough to take in more or less everything and I confess to wondering quite what we’d do with four whole days at the Royal Highland Show and how we’d possibly fill them. I was wrong! We could have spent at least four more days there and still found things to do. From food demonstrations and tasting with chefs, endless free plastic tat to collect, demonstrations of machinery and ideas, three different arenas with constant shows (falconry, sheepdogs, gundog training, stunt bikes, horses showjumping, cart pulling, cattle and horse and sheep and goat judging, donkeys, rare breeds of all descriptions, mini llamas, poultry tents, chainsaw sculptures, pole climbing, sheep shearing, farrier displays, craft tents, rural skills displays) and endless tents with quizzes, games, activities and giveaways. It was a fantastic four days and we’re already looking forward to next years show. Ady and Scarlett came home from the show and had a good few days home on the croft swimming in the river, barbecuing dinners, attending a couple of community events and generally tending to the croft. Meanwhile Davies and I continued on our mainland adventure and flew south to collect our new car, before taking a couple of days driving it all the way back up to Rum. An epic road trip of the type that films are made about. Not made any quicker or more straightforward by the fact that we had been advised not to take the car over 50mph. I must confess that the final 48 hours on the mainland were the type which make me eternally glad I don’t live there any more. All the worst bits – traffic jams filled with angry, impatient and rude drivers, supermarkets filled with expensive items and harassed shoppers, motorway services selling overpriced items of poor quality to an endless stream of autopilot people. Never have I been so pleased to sink into a seat on the ferry and catch my first glimpse of Rum across the water. I drove the new car off the boat and onto Rum flashing the lights and beeping the horn with delight! I have no intention of leaving again any time soon! Normal blog service will be resumed soon – I have much real life catching up to do first but expect photos of the croft 3 creatures and our gorgeous scenery to be reappearing as soon as I have caught my breath. In April just as the tourist season was beginning to get going we were all feeling a little overwhelmed. We didn’t feel properly recovered from the incredibly challenging winter we’d just come out of, we are still grappling with uncertainty about what will happen to us this winter and we seemed to be running to stand still with all the various projects on the croft, along with our other commitments and things we are involved with on the island. Added to that we were missing friends – we have some amazing friends here on Rum and are very fortunate to live in such a community but there can be a tendency to exist in a bit of a bubble here – focused only on what happens here on Rum. Every visitor wants to ask yet more questions about life here, every conversation is based around some aspect of life here, it can be a pretty intense existence. Whilst we share our day to day lives with our fellow islanders and have much in common by virtue of living this rather unusual lifestyle on a remote island with the specific challenges that can pose we are also fairly exceptional in many of our life choices and philosophies – our low impact lifestyle and ambitions of self sufficicency, our livestock keeping, our parenting choices and educational philosophy, our politics, beliefs and ideologies mark us out as different. Some of the very things which define us most and are very big parts of who we are are the aspects of us which can make us feel the most isolated at times. We all miss being with people who get us, who have known us and supported us with our life choices, people who feel like us, who share our interests and passions. Our mainland trip ticked a lot of those boxes for us. We had a soul feeding 3 days with a huge group of friends catching up on each others lives, talking about anything and everything, sharing in jokes and reliving past shared memories of holidays, parties, funny stories. Then to our cob building course where we were instantly among new friends, talking about low impact building, green ideas, permaculture, alternative ideas. A group of people brought together by a common interest, learning alongside each other, sharing life stories and dreams as we trod sand and clay and straw into building material and used our bare hands to build walls together. Within four short days we were parting as friends, exchanging contact details and arranging to meet up again, to help each other with future projects, to stay in touch. Now we’re back on Rum and meeting our very long held ambition to be WWOOF hosts. 3 years ago we were WWOOFers ourselves, just starting out on our adventure and thanks to the generosity, sharing and teaching from our various hosts we learned new skills, experienced a wide variety of lifestyles, traveled the country and ultimately decided what we wanted to do next. We knew then that we would one day love to be WWOOF hosts ourselves and ‘give something back’, pay it forward, spread the word, share the knowledge. For a long time we were really nervous of inviting WWOOFers here and although we have had a lot of interest we have turned people down, worried that our livestyle is too extreme, we are unable to offer suitable hospitality, we didn’t have enough here to enable folk to have the sort of experience we’d like to be able to provide. But we remembered the more extreme places we stayed, recalled that what made a great WWOOF host was excellent communication in advance and during the WWOOF, something different and interesting and varied. So we bit the bullet and offered a small selection of WWOOFers the chance to come and WWOOF here with us. We put together a big document packed with information about us, about the croft, the island, the work you might be involved in, what we would expect from WWOOFers and what they could expect from us. We have been very clear about the facilities here, the challenges and issues. On Wednesday we welcomed our very first WWOOFer to Rum. Rather poetically it is his first WWOOFing experience. So far it has proved to be an excellent match – he is up for all the tasks we need to undertake, we have struck a good balance between working alongside him and passing on skills and knowledge along with setting him up on tasks which are time consuming and prevent us from getting on with other things. His help has freed Ady and I up to get way more done than usual and having another pair of hands has proved very useful. It is very motivating having someone else working with you so our output between the five of us has been way greater than just a quarter more than we would achieve usually. We have had a good tidy up in the polytunnel, sown more seeds, harvested plenty of things, potted on various seedlings and tended to some with added feeds. 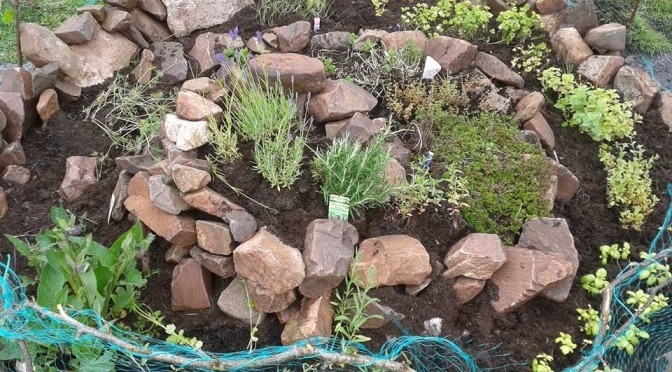 We have overhauled the herb spiral building the walls up a little, adding some fresh compost, created a netted surround to stop all the birds sitting in it, scratching it up and eating all the crops and then restocked it with this years supply of herbs all grown from seed in the polytunnel. It looks fabulous. 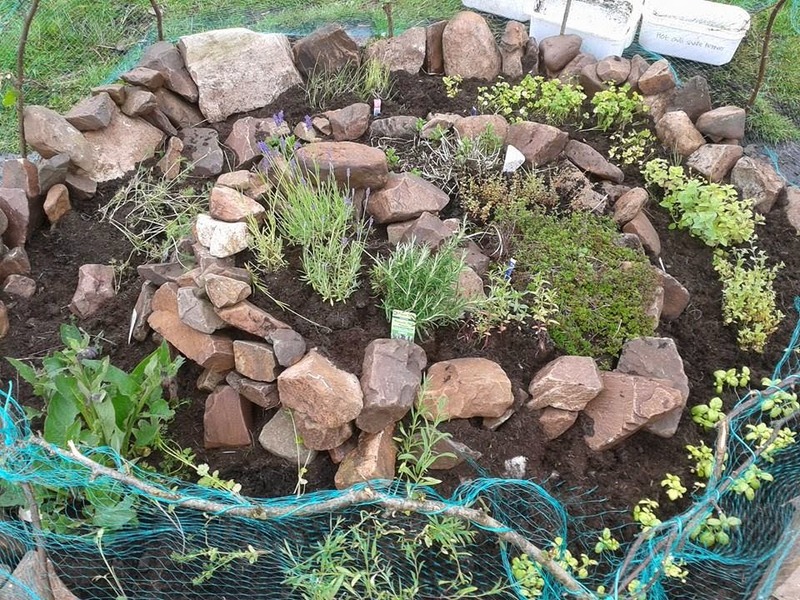 We have also built a mint circle nearby on the same design and have plans for a borage and nasturtium circle next to them too. The spiral has lemon balm, spearmint, oregano, majoram, tarragon, savory, dill, thyme, rosemary, lavender, coriander, basil and parsley. It’s certainly not all work though and in the same way as we had some amazing experiences while we were with WWOOF hosts we are making sure he gets the same chance to explore Rum and get a flavour of what life here is like. So far he has been on the Sheerwater boat trip with us (first minke whales of the season! ), met most of the islanders, enjoyed Friday evening beers at the shop, will be coming to a birthday party with us next weekend and is spending tomorrow off exploring some of the hills with another islander to spot wildlife and the amazing scenery. He’s eaten eggs, salad, bacon, herbs, strawberries and peas from Croft 3 and tomorrow will be trying our pork. Also on the menu at some point will be Rum vension along with plenty of home baking, jams and the chance to come foraging with us. From our point of view we also wanted to meet new, interesting people who might bring us new ideas and approaches, look at our way of life here with fresh eyes and work with us to make our plans come to fruition. We’re only a few days in but so far I think this is working out well for all parties. It’s a bit cobwebby in here! Poor neglected blog. We’ve been off to MainlandLand and had a lovely 10 days away from Rum. For the first time since we moved here I actually felt ready to head off for a while and it did us all good. We are topped up on friends, on fast food, on meeting new and interesting people, on remembering what it is that brought us here in the first place. A splendid fix of just what we needed. We left on a Friday ferry having dispatched Bonnie the dog with one set of friends, Humphrey the hamster with another set and left the croft creatures in the care of a rota of three sets of islander friends along with a full set of instructions. In our absence Bonnie has had a ball living at Kinloch Castle (and not sleeping in her crate at night! ), the wee piglets have grown loads, the turkeys have become extreme free rangers and keep finding their way down to the village (they are currently a bigger tourist attraction than the castle! ), everything on Rum has gone green. We arrived on the mainland, collected our hire car and drove through the afternoon, evening and a good chunk of the night to arrive at friends in Yorkshire around 3am on Saturday morning. We bedded down for what was left of the night and awoke Saturday to an ever filling house full of some of our dearest friends. The total head count for the peak part of the weekend was 65 – that is nearly twice the number of people who live on our whole island – all in one house. Our lovely hosts (with whom we have stayed many, many times) even put their hot water on so I could have a bath! This group of friends have been in our lives for well over 10 years and we have watched each others’ children grow from toddlers to teens. Many of them have made it over to Rum to visit us but we had not seen some of them for over 2 years so it was fantastic to catch up in person. I confess to crying at least twice when the time came to say goodbye to people at the end of the weekend. From there we drove further south to Norfolk where we met up with my parents who had come up from Sussex to join us for the week and spend time with Davies and Scarlett while Ady and I were off during the day time attending a four day course at Edwards & Eve Cob Building. The course was excellent – informative, a great mix of practical and theory with loads of hands on opportunities, run by Kate the Cobbing Queen with fantastic lunches provided by Charlotte. I can’t praise the course highly enough – both Ady and I came out brimming with confidence in our own ability to get to work on a cob build, inspired by the beauty and versatility but above all excited and delighted to have met so many new friends. The course was attended by 12 people including us and over the 4 days we all got to know each other and shared stories, dreams and plans for the future. I know we have met some folk we will cross paths with again and look forward to welcoming some of them to Rum sometime soon. It was lovely to spend time with my parents during the evenings, and Davies and Scarlett had a fine time with them in the day off out on jaunts to various parts of Norfolk including joining us on our last day of the Cob Course to come and see what we’d been up to all week and there for our ‘graduation’ and presentation with a certificate of attendance. We also managed to catch up with friends and fellow crofters for lunch, had an overnight visit and very lovely evening with more friends in their new home before finally making the LONG trip north on Sunday, clocking up 500 miles in one day and getting that first glimpse of Rum across the water on Sunday night. A last night on the mainland within shouting distance of home with the ferry trip back bringing us back to Rum and our ‘real lives’ on Monday. I’ve yet to properly catch my breath but time spent sowing seeds, reaping harvests (peas and strawberries continue to do well), feeding the animals and walking with Bonnie at my heels is doing a fine job of bringing me quite literally back to earth.